The intent and action of the individual will that compels one to enter the portals of Freemasonry and the ongoing process by which one shapes himself as such is a common theme throughout the tradition. It is illustrated by the symbolism and allegory of the craftsman's aesthetics, which is defined as a branch of philosophy dealing with the nature, creation, and appreciation of beauty. Indeed, the whole of the Masonic mythos is said to impart into the initiate the creative skills of ancient temple builders in order that their speculative discipline blossoms into self-exploration. 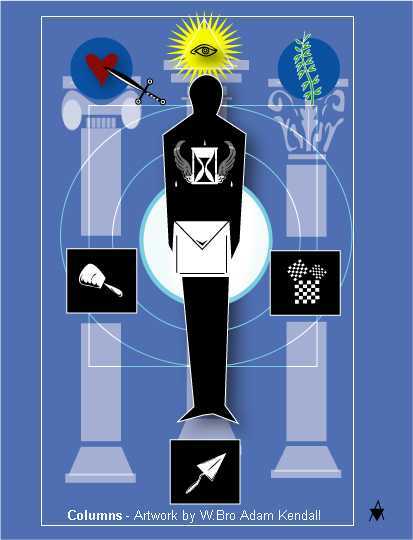 Hence the symbology, ritual drama (or allegory), jargon and (especially) the common origins Masonic history—both of ancestral builders and medieval architects and workers of stone, mortar and metal-- is the central theme of the instructional dramas that comprise Ancient Craft Freemasonry. It has been my personal observation as an artist, that the method of teaching embodies a systematic ritualized illustration of real aesthetic principals derived from a mythological operative past. The path of the aesthete, an admirer of aesthetic principles, is not limited to only artisans, but to all people good and true who are interested in the key precepts of Wisdom, Strength and Beauty. Freemasonry’s ingenious and layers-deep system of rectitude and self-knowledge teaches, at its core, that an individual can build and lead their lives as if it were metaphorically a beautiful, strong edifice—shaped with skill, but, alas, not without the least effort or exertion of regulated force and restraint. Herein lays the necessity of training a technique that requires a natural predisposition to a creative and rational mindset. Were this philosophy devoid of appreciation for the supra-conscious and spiritual part of man, it would be rigid and devoid of the mechanics that encourage the development of creative possibilities. Conversely, if it was purely creative for its own sake, the effort would be deemed unfocused, no matter what the design. For the arts in all of their forms: the scientific; the medical; the architectural, and the Fine; all combine formula, intellect, logic, and reason with mercurial intuition and creativity. These professional arts are also are dependent upon each other-- for many buildings would never be erected without the metallurgist or other scientists, such as an engineer or seismologist to determine the finer points of the building’s structure and its relationship to the earth on which it sits. Moreover, none of them can be expressed without the skills of the fine artist who may draw the anatomy of a building or a body to use as a map for the architect or surgeon. In fine, aestheticism is the ideal by which all skills of the human being may unite to create a work of art in perfect harmony. This is a very important point when considering the unity and interdependence in nature. Intent and action must be balanced in order to reach its goal--which is to create something, as mentioned before, balanced and perfect. However, the end result is not the finality; the process of its creation determines its perfection. Therefore to the aesthete, the process of understanding the path and the way one may affect the unfolding of its becoming, lies in the patient acquiring and exercise of skill-- which is the harmony of intent and action. In Freemasonry, one set of symbols that exemplify the aesthetic principles of determining and evoking the potential in art and livelihood is the Rough and Perfect Ashlars. They are a class of symbols surprisingly overlooked in some jurisdictions, which seems strange considering Freemasonry concerns itself with the very subject of building in stone! It is a class of symbols whose equation and sum have an important mention in all degrees of the Craft Lodge, primarily in the Entered Apprentice, the Fellow Craft; but also within the degrees of Mark Master Mason and the Royal Arch. The ashlars are actual objects to be shaped and fit by the stonemason, just as they are symbols of the aesthetic process of creation, which includes at every point the balance of technical skill of every successive degree or level of understanding. By shaping the ashlar from a state of roughness (that is, pure potential) to something beautiful and potential manifest—not just merely useful-- the intent and action of its creator’s intellect and creativity may be determined. Notice the mention of the tools of the first degree—the mallet, (the common gavel), and the chisel (which is not included in California Preston-Webb ritual for the Entered Apprentice, but exists in various English and Continental European workings). Indeed, this chisel should be considered a very important tool even in our Preston-Webb work, in relation to the 24-inch gauge—for both are the handmaidens of the gavel without which it would be a mere instrument of force. By a regulated blow from the mallet (or gavel), with the guidance of measurements set by the gauge, the chisel may make its cuts made by the skilled craftsman. From the use of skill and intelligence as stated by Gadicke one can deduce how these tools would be helpful. Meditation and thought on these symbols are required by the speculative craftsman so as to derive the beautiful allegory of their use in order to give a place in one's personal mythology. As per Macoy, it would seem that the perfection of the ashlar is a result of applying the aesthetic principal that will draw forth the stone's true beauty by first recognizing its inherent goodness and perfection, and by peeling away the layers to expose its inner nature. This unveiling of true potential is made manifest by a long and sometimes arduous road; the process requires knowledge coupled with knowledge intuition or faith, that is, creativity. The speculative mason learns the manner by which his technique and creativity combined and perfected through degrees or equations assist him in developing latent creative powers. Today in California lodges are re-adopting the use of the ashlars and placing them side by side in the East. A number of traditions, particularly on the European Continent, also accord both ashlars an important place in the East, but with interesting differences in their arrangement, which alludes to their purpose in ritual-- of whose definition we can clearly benefit. In some German Masonic rituals, for example, the rough is situated on the first step to the dais of the Worshipful Master. The perfect ashlar is placed on the second step, which symbolizes its relationship with the duties and tasks of the Fellow Craft--to use the perfected stone as a measure by which his tools are trued. If one follows the second degree in the American rituals, the same deduction can be made. It is by the hewing of the rough stone to its smooth and perfected state so it may fit perfectly in the building, and that by it all tools may be trued and kept aright for continued use in our lifetimes. Thus, this perfect stone becomes to our speculative profession a symbol of the greatness of the virtue that was born from the rough state by the skilled determination of the craftsman to its true potential as a useful part of the whole. By considering this beautiful class of symbols interdependent with the working tools of every degree in Freemasonry, one may begin to develop a deeper attitude in regard to our Craft: recognition of the aesthetic approach is necessary in order to properly develop the skill in one's life. The aesthetic principal lends to skill a particular quality of personality--without which a proper development of our character would be impossible, or at least produce flawed and unfeeling traits in the individual. Embracing aesthetic beauty creates for the Freemason level foundations of an enlightened and intelligent morality by which one will stray to no extreme, but rather walk softly on a path of balance and mildness. On this path, the interplay of force and support combine to hold the frame aloft. Using faith combined with ingenuity, creativity, and the willingness to go further, one can utilize this symmetry to create one’s own life into a temple. This evolutionary process is embodied in the definition of beauty. Thus, perhaps it can be said that beauty is eternal and ever unfolding, as is our knowledge of what is Divine. This is aestheticism as practiced by all artists and brought forth by the knowledge of their craft.